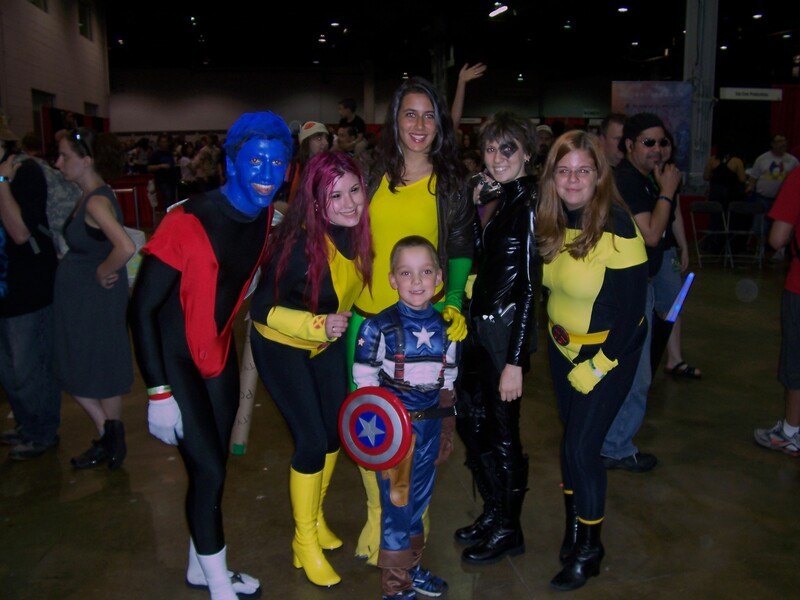 In 2009, I was done with Wizard World Chicago/Chicago Comic Con. 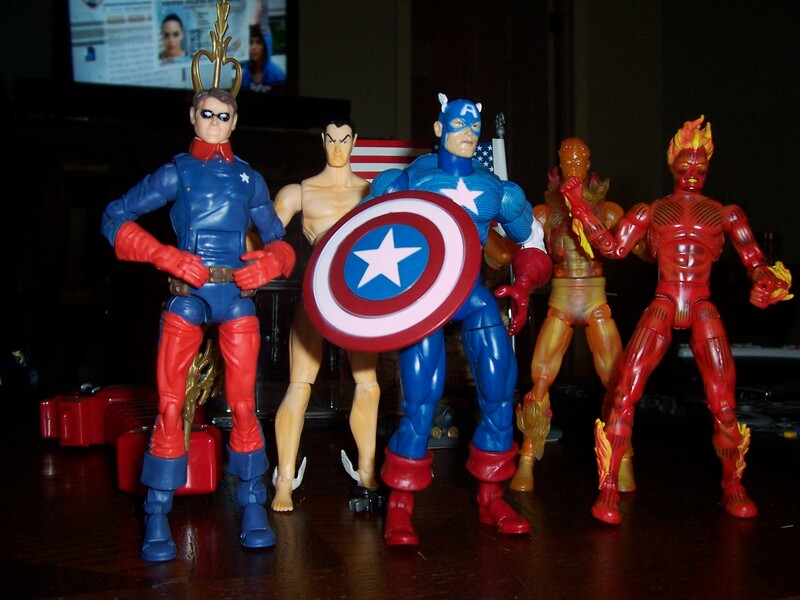 Marvel and DC were gone, WizKids and Heroclix were gone, and the show just didn’t have much appeal for me. I went and didn’t enjoy much except introducing my then four-year-old son to the world of cons. And Transformers. C2E2 launched in spring 2010, and I was sure that it would be the end of Wizard World Chicago. C2E2 had Marvel and DC, and all the comics panels that Wizard World Chicago no longer can deliver. It was in the spring, so it didn’t feel like all the panels were just repeats of San Diego Comic Con. C2E2 was at McCormick Place; it felt open, expansive and clean. Wizard World Chicago was at the Donald E. Stephens Convention Center in Rosemont, and has always been cramped, crowded, and sweaty. 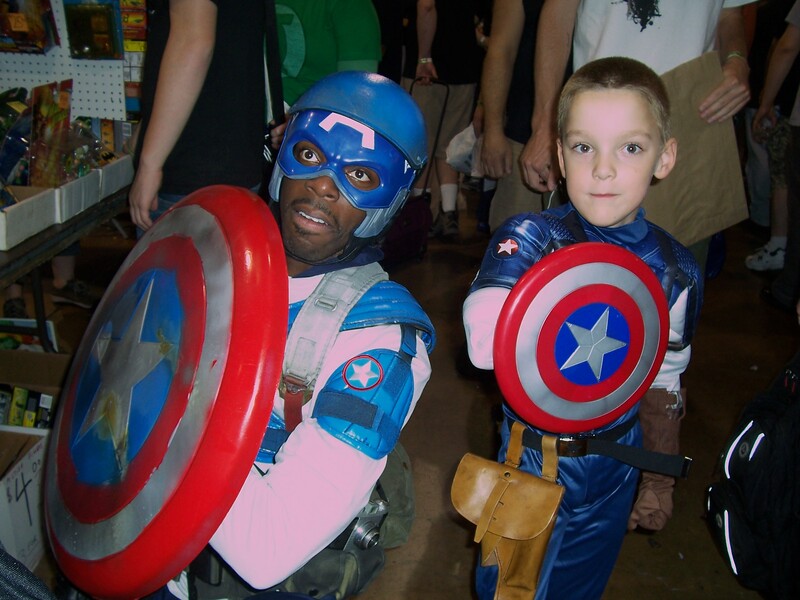 My son and I had a ball at C2E2 2010. They had wonderful children’s programming and we had a fun day. We only spent one day at Wizard World Chicago 2010. It was mainly a toy shopping show for us since we were going on vacation and had to go on Saturday instead of the children’s day on Sunday. Afterward, I wasn’t sure we’d be coming back in 2011. We had fun at C2E2 2011. 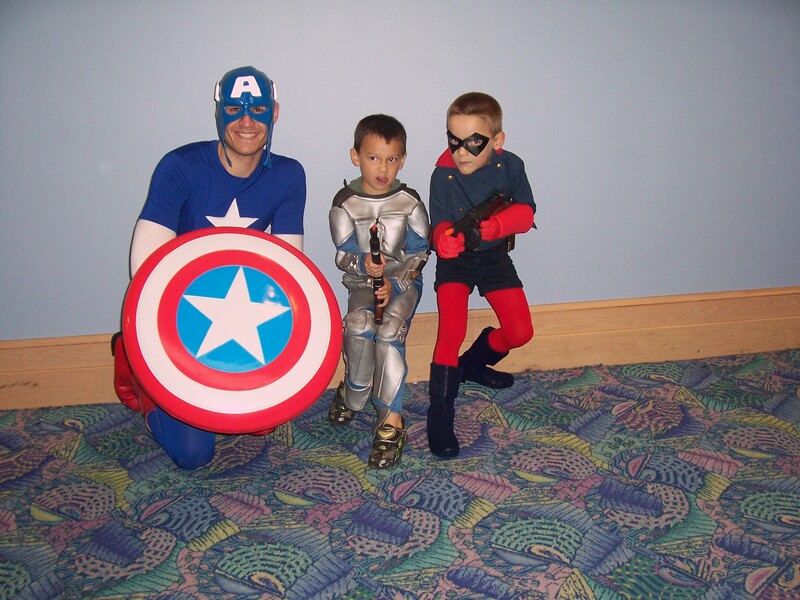 Sunday was a day of programming for children, and it included screenings of Iron Man Armored Adventures and SuperHero Squad episodes from Marvel Studios, two of my son’s favorites.. My son was in the costume contest, which was on a big stage with lots of seating and was done very well. Overall, I couldn’t imagine how Wizard World was going to compete. Then a funny thing happened on the way to Rosemont. 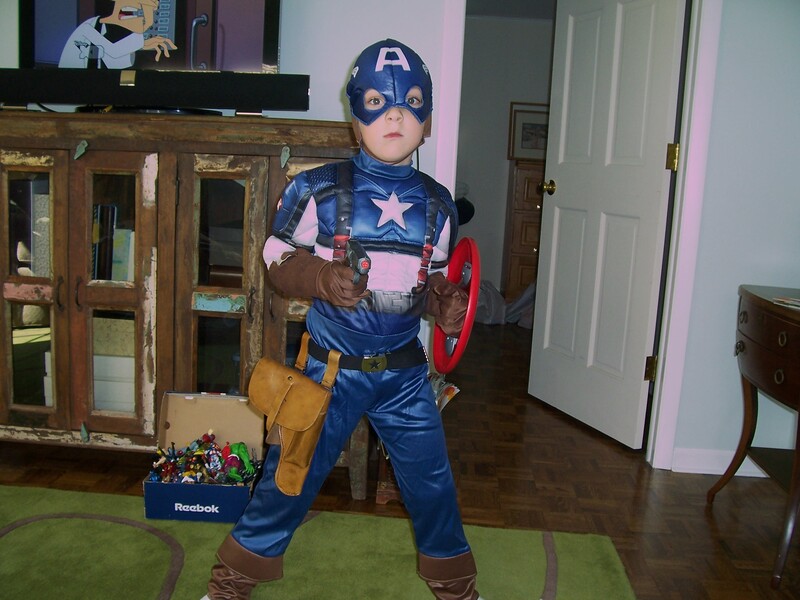 My son decided he wanted to go to Chicago Comic Con as Bucky, Captain America’s WWII sidekick, on one day and as movie Captain America on the other. 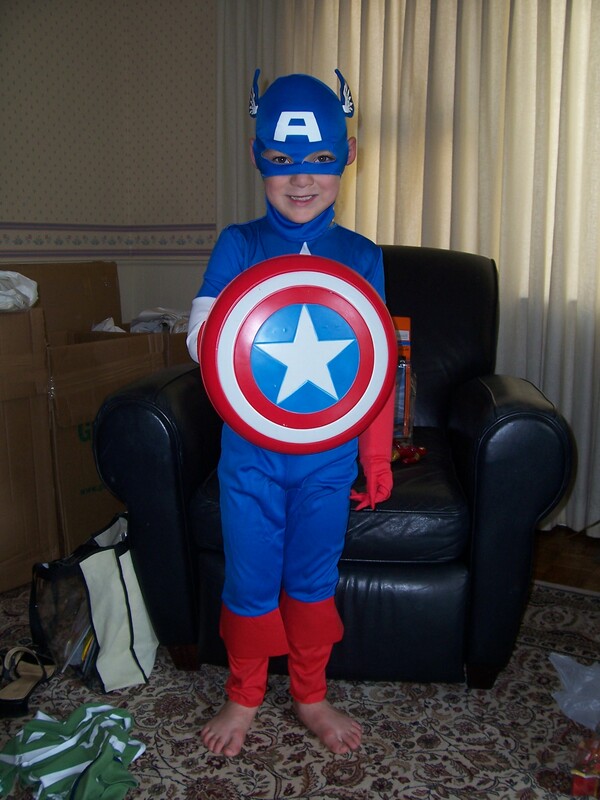 The movie Captain America was relatively easy; it just took a visit to our favorite online costume store, BuyCostumes.com. But in case you didn’t know, you can’t just buy a Bucky Barnes costume, even with the movie coming out this summer. 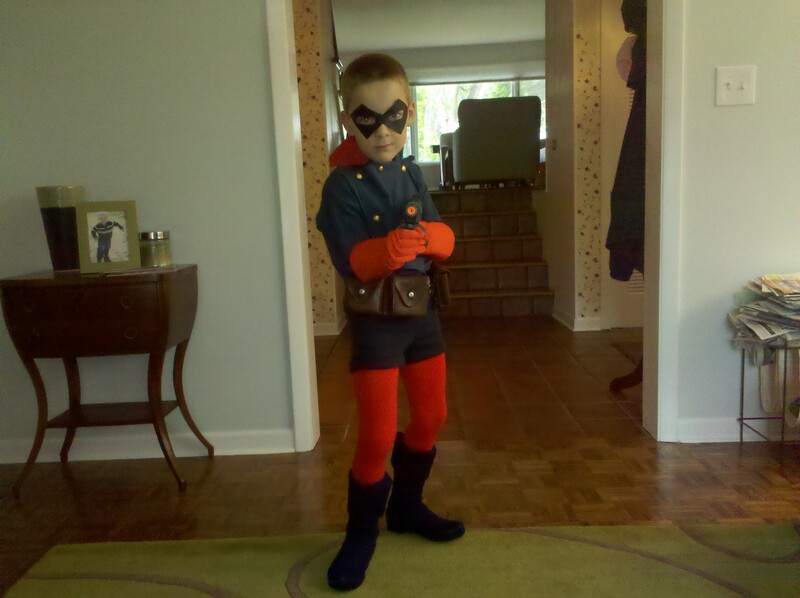 This meant we had about two months to put together a Bucky costume for Comic Con. And that we had to go from wearing a store-bought costume to full-blown cosplay this year. 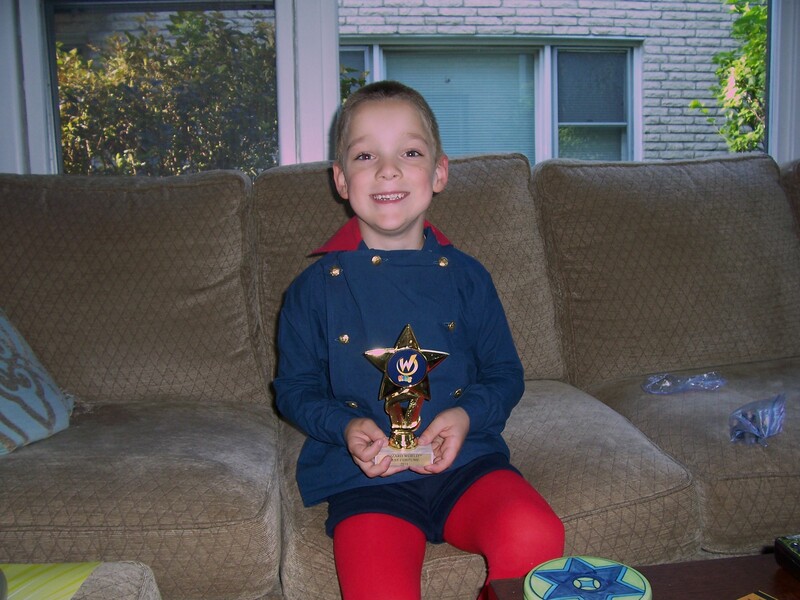 As we put together the Bucky costume, our excitement began to grow. Chicago Comic Con became less about who the guests were and what the panels were, and more about the costumes and the experience of being with other people having fun together. 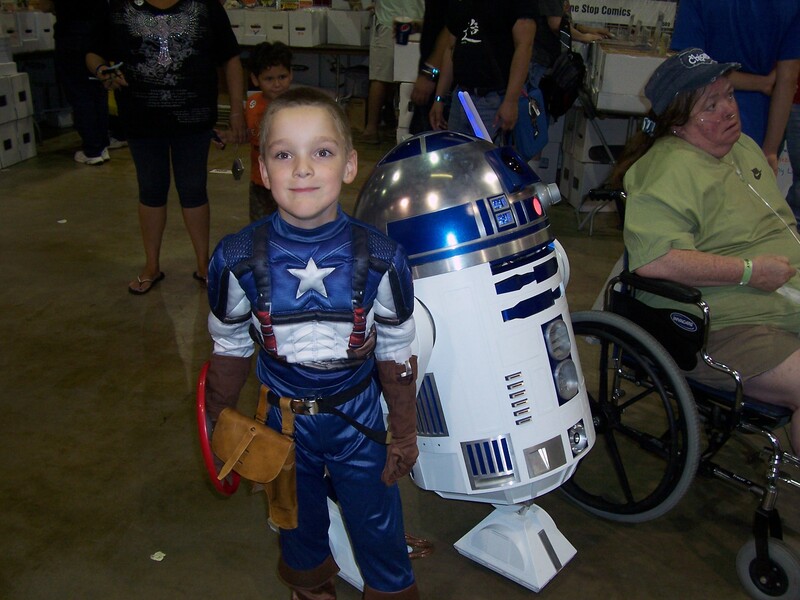 We had more fun at Chicago Comic Con 2011, held on August 11 through 14, than we have had at any previous con. That is what Chicago Comic Con has become: a place to experience the joy of comics with other people. It’s not about the comics so much as it about a celebration of the people who love comics. And the toys. When you take a six-year-old, it is always about the toys. Saturday was our shopping and photo day. 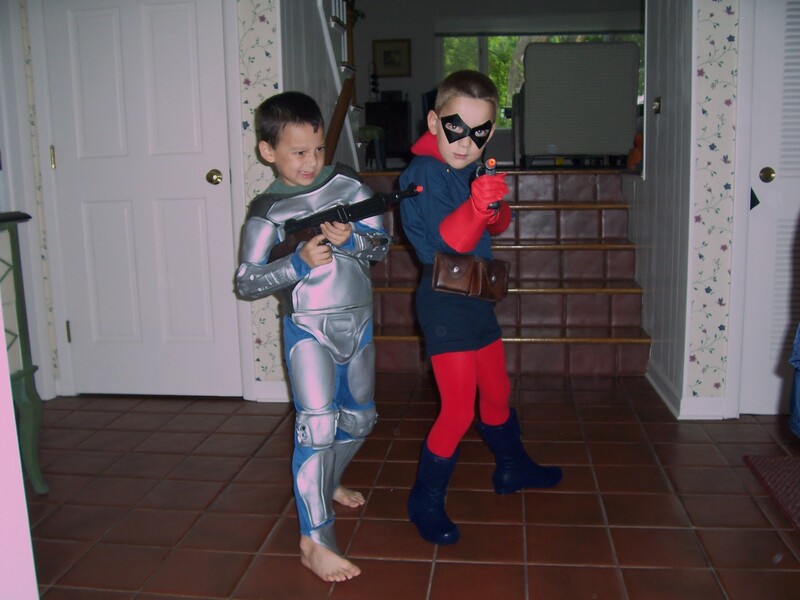 My son used to be shy about posing with strangers in strange costumes. Now he jumps right in and poses with the best of them. He had fun identifying different costumes, and since he was dressed as the movie Captain America, he even got to shoot the teenagers dressed as Nazis (with a capless cap gun with the appropriate orange barrel plug, and to the cheers of a crowd, I might add). "We won War World II together." 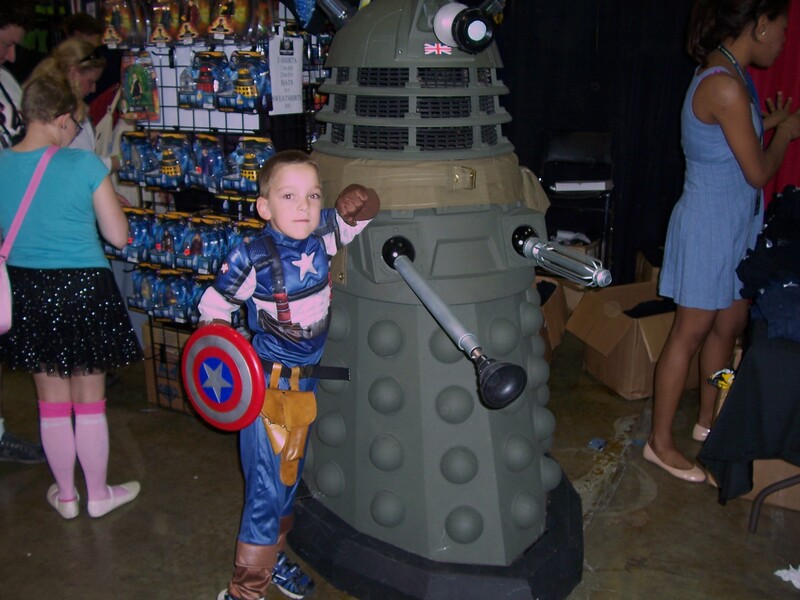 Captain America and a "good" Dalek. 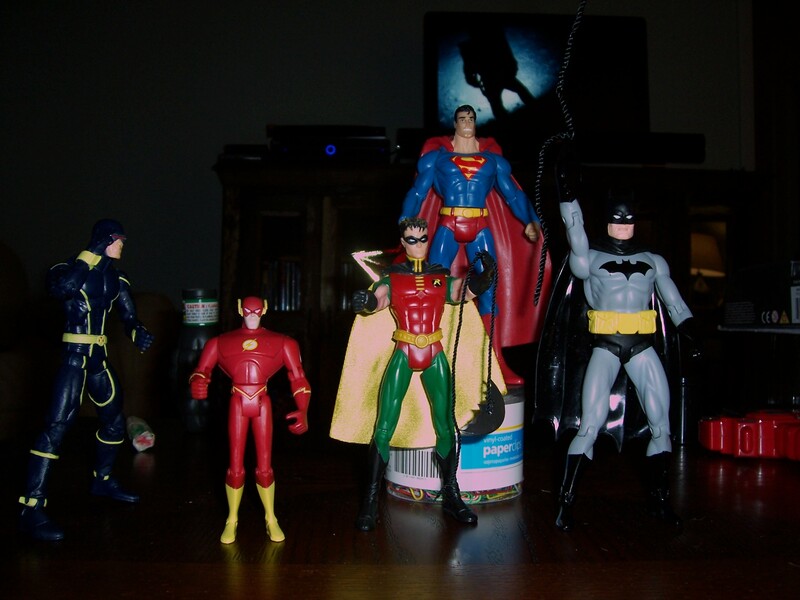 I have used Comic Con and my son’s desire for action figures to teach him about the fine art of haggling. It is amazing the deals that vendors will cut with a cute little boy dressed at the Sentinel of Liberty. Needless to say, the haul this year was epic. On Sunday, my son and I took one of his friends to the show with us. This friend is a huge Star Wars fan, and with the 501st Legion and the Chicago Jedi regulars and Chicago Comic Con, we knew he would enjoy the show. The great thing about all the Star Wars cosplayers is that they love to pose for pictures and they are wonderful with kids. Both groups make the whole show fun and they are probably the largest contingent of recognizable costumes at the show. The children’s costume contest wasn’t perfect. It was scheduled in a room that could hold about 50 people. There were about 100 kids who wanted to participate. With parents and siblings, there were probably close to 300 people who wanted to watch the contest. 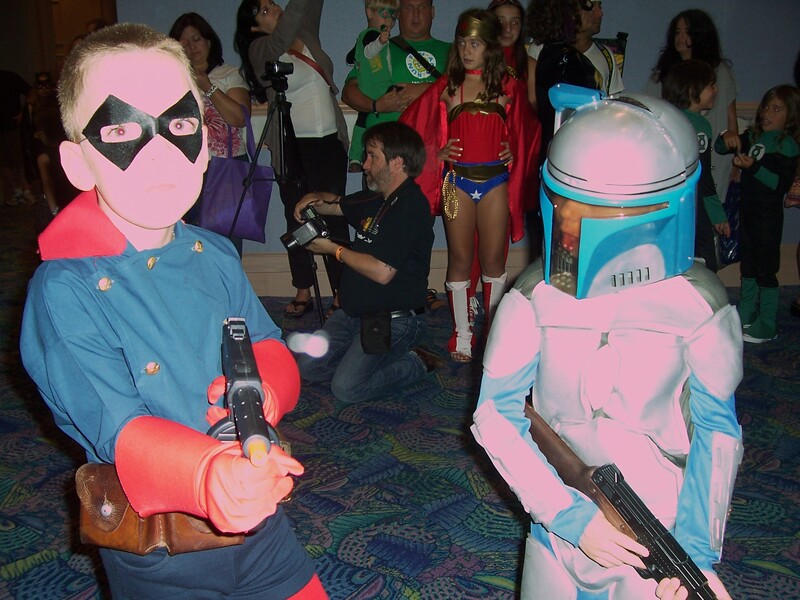 Why they wouldn’t put the children’s costume, scheduled on Kids’ Day at Chicago Comic Con in a ballroom, I’ll never understand. The whole thing was moved into the adjoining hallway. Despite the inconvenience, it was a huge success and an unbelievable display of cuteness and earnestness. 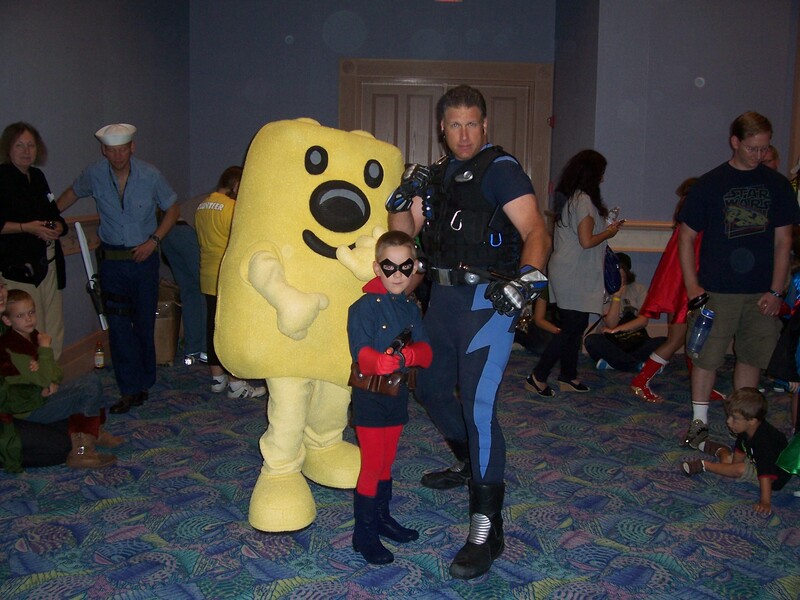 Bucky poses with Wubbzy and the Defuser during the children's costume contest. After posing with the Wubbzy and the Defuser, all the kids got to pick out a prize. The most popular? Light-up swords. 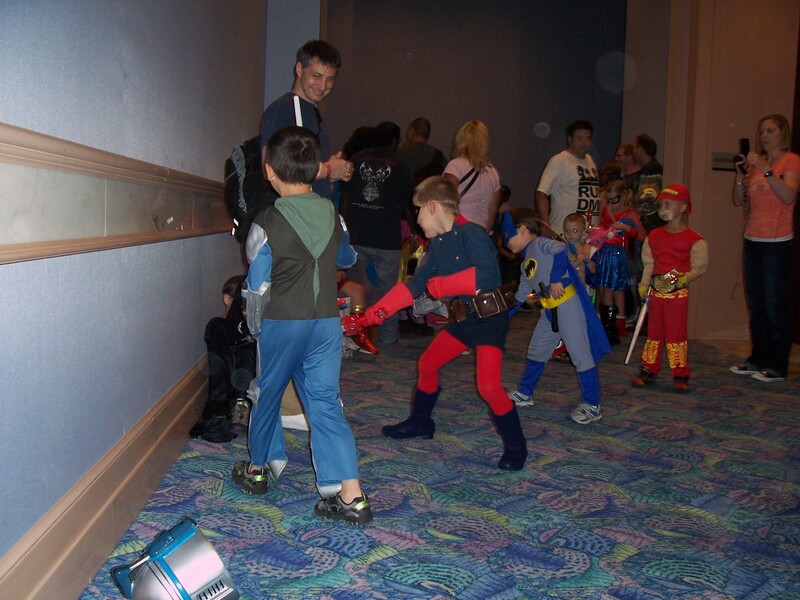 What happens when you put a large group of children in superhero costumes in a tight hallway with light-up swords? A battle royale, of course. Fortunately, no children were injured during the sword fights. Cosplay Melee! This is what happens when you give a bunch of costumed children light up swords for prizes. 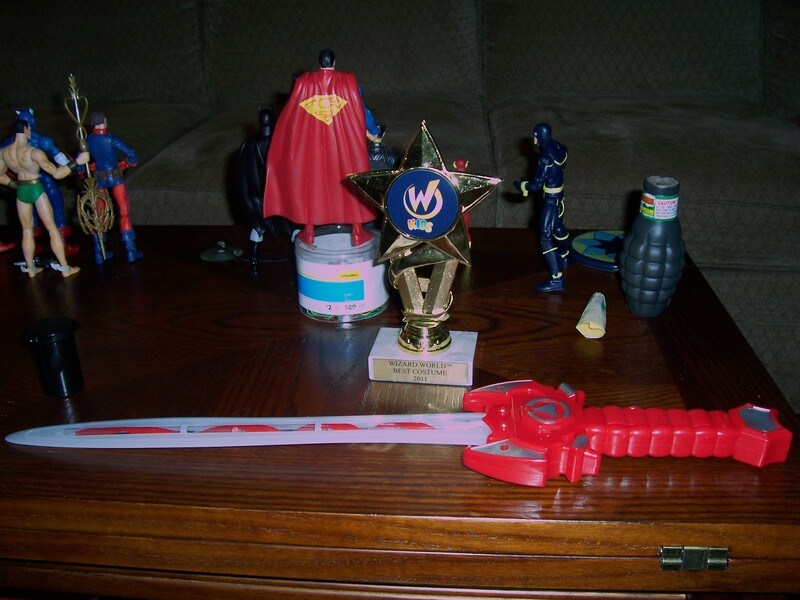 A trophy and sword, prizes from the children's costume contest. Chicago Comic Con has changed over the last five years. The focus is less on comics and the major comics companies and more on the artists in Artist Alley, the movies and television shows that appeal to lovers of comics, and the fans themselves. It isn’t San Diego Comic Con, but then I think Wizard World isn’t trying to compete on that level anymore. Instead, they have made a place for like-minded people who love the same things to get together and share the love. We’ll definitely be back in 2012, and I’m sure we’ll spend even more time putting our costume(s) together. If you are in Chicago in August, you should consider coming, too. Could you say no to this face?